If you’re heading off to the races or just want to watch the action with us, there’s a package to suit you. Heading to the races? Why not enjoy the day with us for the very best in luxury and entertainment? Whether it’s starting the day in style, a night of parting or luxury travel to and from Aintree – we’ve got it covered. Why not enjoy all the thrills and spills of Aintree races with us instead at The Sir T Brasserie & Bar for a day of fun and excitement right in the heart of the city centre with a Race Day Experience? Equipped with a large drop-down screen, you won’t miss any of the action while enjoying all the races in our newly refurbished restaurant and bar with no queuing up to place a bet, no standing in the rain to watch the races, no walking for miles to find a cab or catch the train. 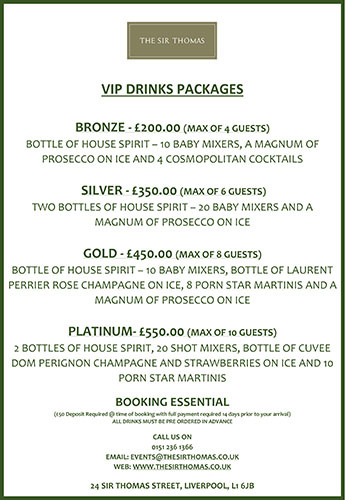 To put a little sparkle into your day we also have a range of drinks packages for you to choose from. Please click on the menu below to download or special Aintree 2019 drinks menu.